Hi lovelies! Emma here. 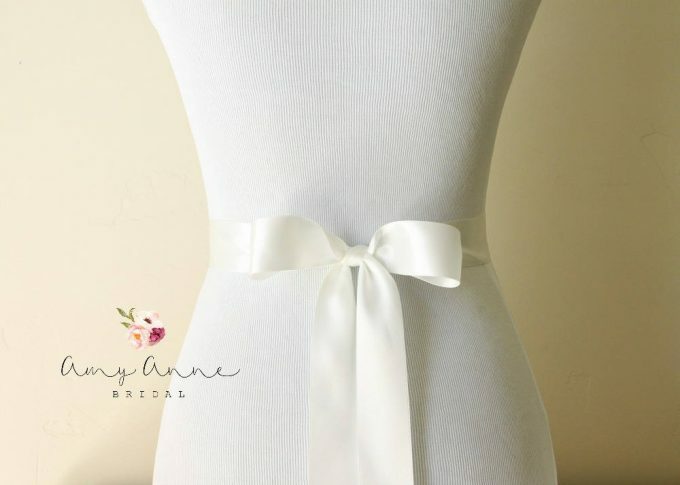 Question — are you having trouble finding inexpensive bridal belts / dress sashes for your wedding? I know, they can be crazy expensive. Many luxury wedding dress sashes are hand-beaded, designed with the most delicate materials, feature Swarovski crystals, rhinestones — the whole nine yards. It takes time, patience, and lots of materials to design and create each one, but many are wayyyy over your price range to even consider. Am I right? 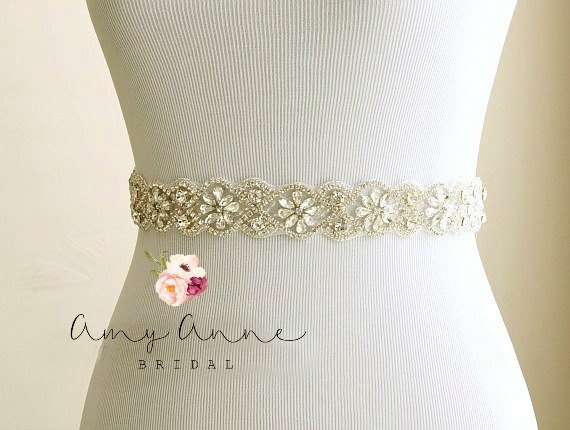 Amy Anne Bridal is a designer of handmade wedding dress belts and hers are incredible. It’s one thing to offer amazing product, and another to be able to deliver on customer service. Based on reviews we’ve read, Amy does both! She even made a “rush” sash order for a bride who, nine days before her wedding, was told by her gown atelier that her original dress sash was lost! 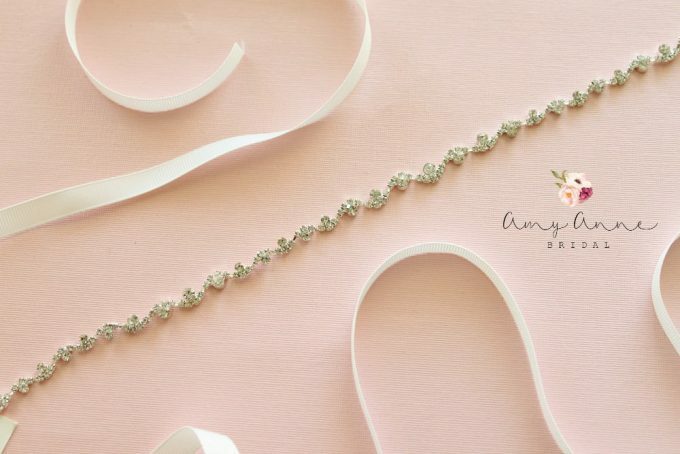 The bride-to-be turned to Amy who designed a custom wedding sash for the bride delivered in time for her wedding. 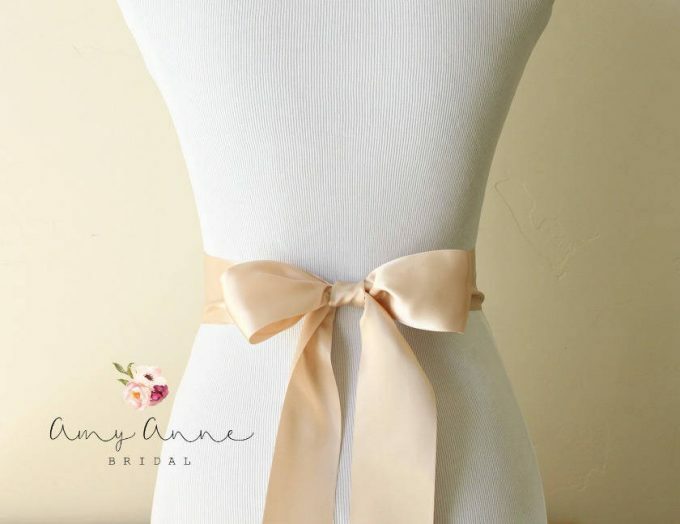 The bow sash is shown above in Antique Mauve and it is only $8. Amazing! 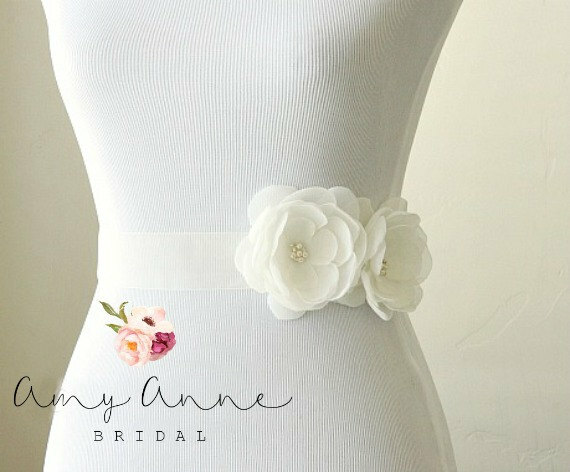 To show you just how much we adore these beautiful yet inexpensive bridal belts, we’ve hand-picked ten of our favorites. You — and your budget — are going to be pretty pleased with what we’ve found! A little bling doesn’t have to blow up your budget. 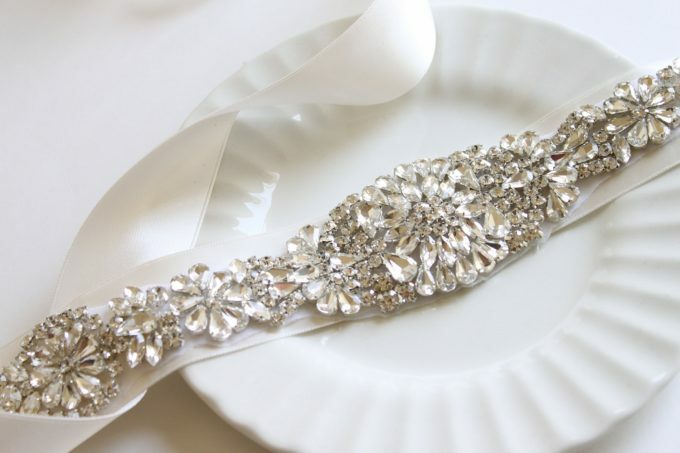 This rhinestone sash is elegant and comes in at under $45. Buy it here. 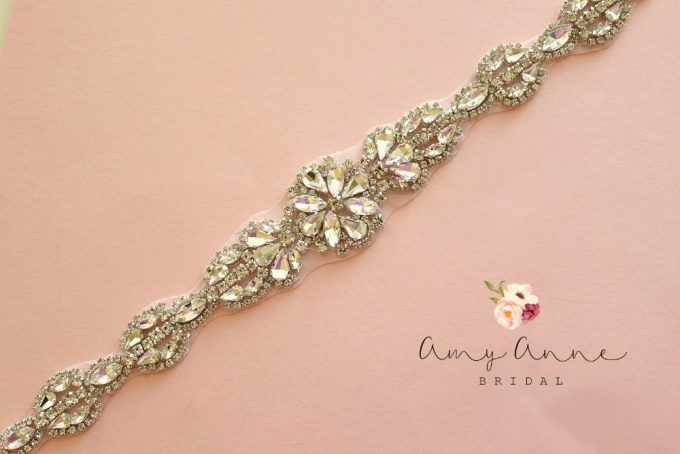 These crystal clear rhinestones on this sash will look beautiful on any wedding dress silhouette! It is available in five different ribbon colors to accentuate your wedding dress perfectly. This sash is under $40! Buy it here. What do you think of this one? I call it one of my favorites, as it reminds me of Vera Wang’s organza sash. 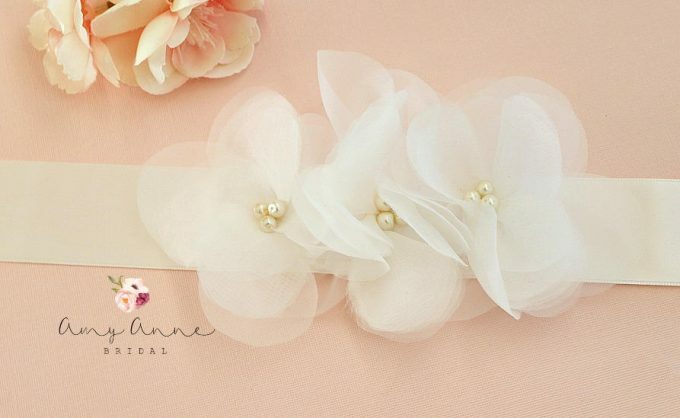 This flower sash is made of ivory organza and chiffon flowers. Each flower is hand-embellished with ivory glass pearl centers. This sash is under $100! Buy here. This affordable wedding dress sash is an even more inexpensive alternative to the one shown above. It features a trio of chiffon flowers and comes in at only $46. Buy yours here. The rhinestones on this sash are crystal clear. The bead work and rhinestones together make this a true statement piece! Price: $58. Buy yours here. Can you think of a more beautiful combination than light ivory organza flowers, delicate off-white lace detail, and light ivory glass pearls? Me either. This stunner comes in at under $100. Buy it here. 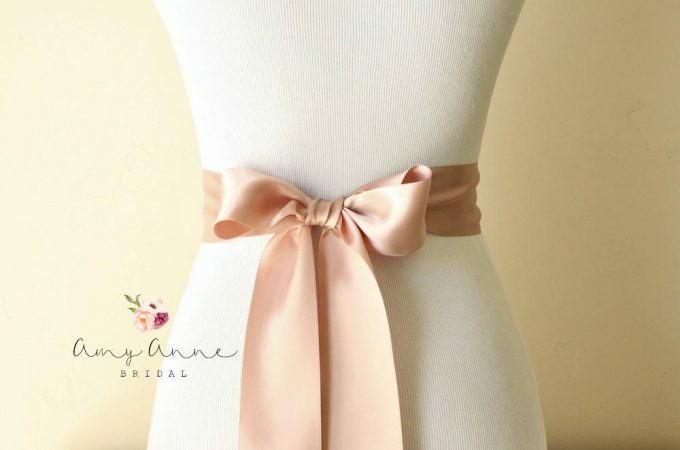 This is three yards of luxurious double faced satin ribbon in the prettiest shade of blush you’ve ever seen. Just tie it in a bow and you’re all set. Cost? Only $12! Buy it here. 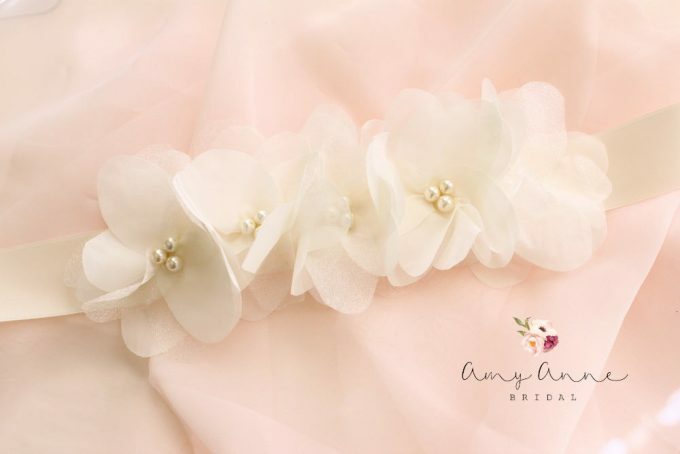 This organza flower sash is simply stunning. I especially love those blush glass pearl centers! Only $95. Buy it here. 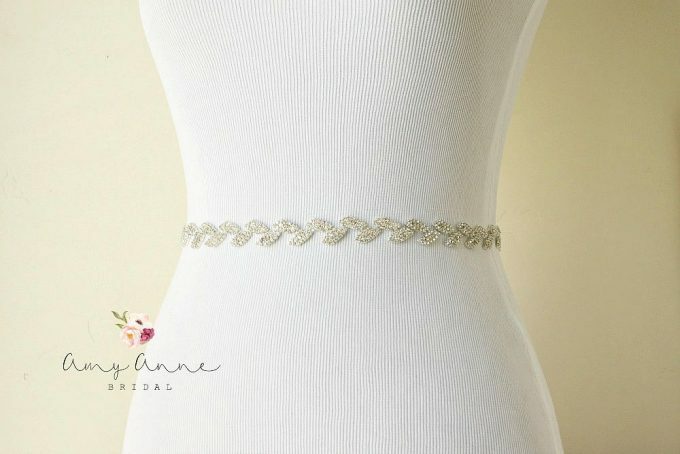 In this list of inexpensive bridal belts, this is the sash I would pick; it reflects the color and look of my own wedding dress! Ah, ivory chiffon flowers, hand-turned edges, hand-cut, hand-sewn, hand-embellished flowers… did I mention ivory glass pearls and Czech glass crystals? Ooh la la! Only $52. Buy it here. 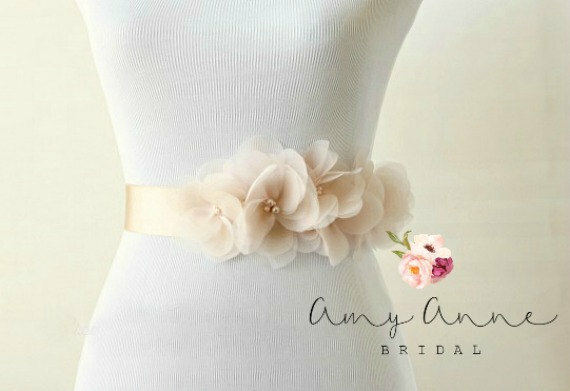 Last but not least, this is my second favorite on this list of inexpensive bridal belts! What a statement piece: rhinestones, pearls, white and ivory tones…. and I love the floral design made from the rhinestones! Under $60! Buy here. 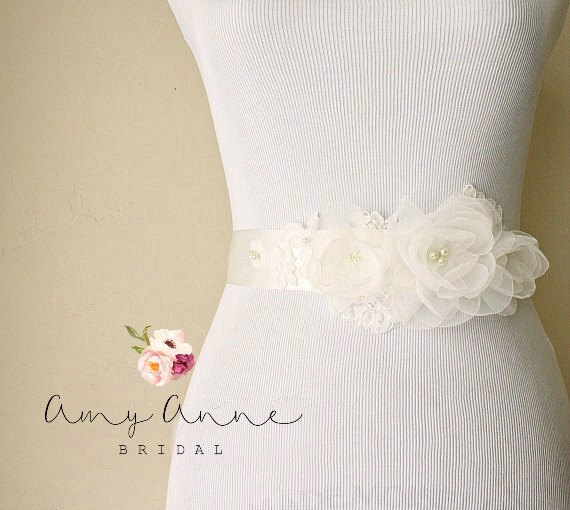 Comment on → Inexpensive Bridal Belts: Which one is your favorite? 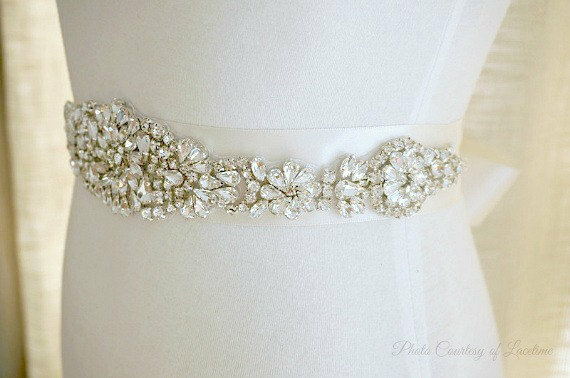 OK – now that you’ve seen some inexpensive bridal belts, what do you think? Will you be adding one to your dress? Tell us why or why not in the comments. For more handmade sashes, shop The Marketplace! You’ll find hundreds of high-quality handmade wedding products from our amazing Featured Artists! It’s exclusively at Emmaline Bride. Shop now!